Lake Como has been charming visitors to its shores for hundreds of years: think sparkling blue waters edged by high mountainous peaks, laid-back sunny days and starry nights; the natural beauty of the Lake Como is almost unrivaled. 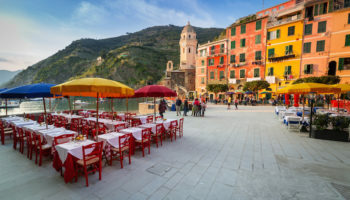 Travel to the famous Italian lake and spend your holiday tucked away in lakeside villages, indulging in authentic homegrown Italian food or engaging in life on the lake. There is something for everyone to enjoy from hiking and watersports to sightseeing or simply sunbathing. Spend your time staying in the grand villas and wallowing in the richness that the epitome of Italian decadence. Lake Como is famously opulent, but there are alternative, affordable lakeside resorts to choose from, or stylish lodges for those who have a tight budget. 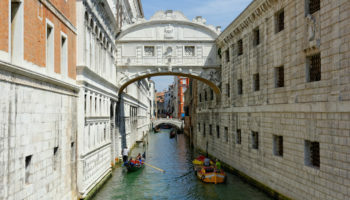 The area’s small hamlets and popular waterside hotels are easy to travel between, with many locations and villages connected by regular ferry services that zip between sights. If exploring the lake is your thing, make sure to stay somewhere central to cut travel time. A train line connects main towns with Milan and other larger towns, which makes the area easy to get to from the airport. Lake Como has been enticing people to its shores for years, from famous faces to humble travelers. There’s something about the lake that attracts visitors to stay longer than planned: maybe it’s the food, the clean air or the healthy living, but we reckon this should be your next holiday destination – here’s a guide on the best places to stay in Lake Como when you visit this beautiful corner of Northern Italy. The most famous town on the lake, Como is surrounded by verdant green hills and beautiful scenery. 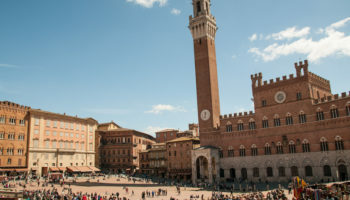 The historic old town charms visitors with terrace cafes and piazzas where people meet to chat and enjoy good food. 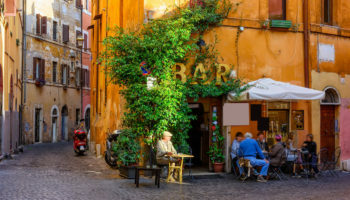 The Italian way of life is clear to see here with lively shops and bars bustling and other busy places. Como has plenty of historic sites, such as the Basilica di San Fedele, which dates back to the 10th century. Take the old funicular railway up the hill from Como to Brunate, or take the bus to nearby villages. If you want to stay among the vibrance of Como during your trip then you can choose to stay in one of the town’s grand old hotels or, for a mid-range option try one of the three offerings and soak up the atmosphere. Hotel Metropole Suisse – Hotel Metropole Suisse is an elegant 4-star offering right in the very heart of Como. Boasting views of the lake and the Alps, it’s not completely lakeside but the ferry pier is right in front of the hotel. The interiors are unfussy; it’s not exactly a luxury place but it’s got traditional features and spacious, classically decorated rooms. The hotel restaurant features a terrace and serves up fresh Lake Como fish. Como Cathedral is just 300 meters from here. Hotel Como – It’s called Hotel Como and it certainly delivers as one of the premier hotels of this town. With its rooftop terrace, guests can enjoy great views of the mountains and lake with a drink in hand. The large rooms at this 4-star offering feature all the simple style you’d expect of contemporary design: wooden floors, large comfy beds, and a neutral color palette. There are great coffee shops and bakeries practically on the doorstep, plus the ancient Baradello Castle is less a kilometer away. Hotel Rossovino Como – Set slightly out of town (it’s just 15 minutes from the center) Hotel Rossovino Como is a great choice if you don’t mind not being in the heart of Como. The rooms here are spacious, clean and comfortable; elsewhere there’s a sun terrace and a lovely little garden to stroll around. There’s a great buffet breakfast with fresh pastries and fruit on offer. If you’re on a road trip, this place is good since there’s complimentary underground parking on offer. Bellagio is a classy little village that has long been popular with visitors to the lake. The village sits at the top of a hill between two pretty beaches and is a tiny town that’s packed full of charm. Bellagio is full of history and is a great spot to spend romantic breaks, enjoying the views and discovering the lake. Amble along cobbled streets, shop in the chic boutiques and enjoy dinner at one of the many restaurants. Ferries stops off at Bellagio’s dock to take people to other sites around the lake. Accommodation in this stunning setting is luxury and hotel rooms are expensive; choose to stay in one of the lavish 5-star offerings and live decadently on the edge of the lake. Grand Hotel Villa Serbelloni – Grand Hotel Villa Serbelloni is the luxury resort for you if you like your accommodation classic. This 5-star hotel has been in the same family for three generations and dates back to 1873. It’s located at the end the Bellagio Promenade and features views of Lake Como and the Alps. Set in beautifully maintained and secluded grounds, the service here is, as you’d expect, top notch and the staff can’t do enough to make you comfortable. An exquisite place to stay all around. Hotel Belvedere – Hotel Belvedere is a sumptuous 4-star offering that’s incredibly been owned by four generations of women. 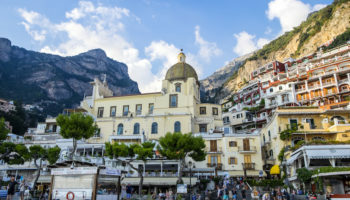 Dating back to 1880, this is a wonderful place to stay in an amazing location; it’s close to the water’s edge and close to Bellagio Ferry Terminal, meaning cruises on the lake are never too far away. This place has a friendly atmosphere in a serene setting; set back from the busy center of town, it’s a place to stay for some peace and quiet. Hotel Du Lac – Set in the very heart of Bellagio, right opposite the dock in the main square, you can’t get much better in terms of location. Staying at Hotel du Lac is all about soaking up the local atmosphere and trying out local eateries and bars. Back at the hotel, you’ll be able to dine in a rooftop restaurant with lovely views. All the rooms have been recently renovated for extra comfort and more modern facilities. Tiny Menaggio sits on the shores of the lake ​and its easy transport links make it an attractive and popular resort town. The towns mountainous surroundings appeal to visitors who like hiking, and this part of the lake is great for swimming and watersports. The town offers a shady setting to enjoy the scenery, and boats can be caught to beauty spots around Como. Bakeries and casual dining options serve fresh and reasonably priced food – you can sit in the town square and sip coffee as you watch the life on the lake. Stay in the 3-star hotel with lovely landscaped gardens, swimming pools and views of the lake. Grand Hotel Menaggio – The clue is in the name – this place really is grand. It’s set right on the shores of the lake and makes for an elegant, charming place to stay. Here, you can swim in the outdoor pool, dine in one of the two restaurants, and be surrounded by the beautiful hotel gardens – all with a view of the lake. To make it even more elegant and luxurious, the classy feeling is heightened with live piano music so you can really enjoy those terrace drinks in style. Hotel Garni Corona – Hotel Garni Corona overlooks Lake Como itself. It’s a warm and welcoming sort of place to stay. If getting around is a concern for you, don’t worry – situated in the main square of Menaggio, there’s great access to public transport just nearby. 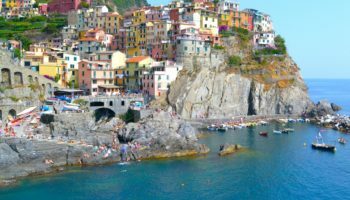 It’s a small and classically Italian place to stay – think charming balconies that look out over the water. The rooms here are all about understated Italian elegance. If you’d like to head out on a boat, it stops just five minutes away from the hotel. Situated in the center of the action, Verenna’s old buildings and interesting lanes create an alluring holiday destination. The village’s big draw is its waterfront, which is one of the best in the area. The pebbly beach draws sun-worshippers to the shores of the lake to spend weekends picnicking and socializing. Stay in Varenna if you want to relax during your holiday and explore the famously Italian gardens of Villa Monastero and Villa Cipressi. You can travel easily by ferry to other resorts around the lake and the town is connected by the main railway line. Stay in impressive hotels with private lakeside grounds – or further up the hill there are some more budget friendly options which still boast great views. Hotel du Lac Varenna – Nestled amidst the tree covered hills, this hotel is right in the middle of Varenna. It’s on the lakefront – in fact, Hotel du Lac Varenna is so much on the lakefront that it even has its own jetty. It’s all about lakeside living here – looking out over the lake from your room and dining out on the waterside terrace. The rooms are rustic and traditional. As long as you’re not expecting the utmost luxury, you’ll be right at home with its incredible setting. For a slice of the luxury lifestyle of Lake Como on a budget, stay in lovely Lecco. Spend a few nights sleeping in hotels with lake views for much less than other Como resorts. The accommodation is centered around stylish boutique hotels with balconies. 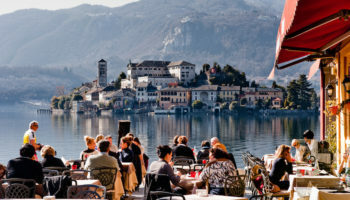 Whilst in Lecco, take the ferry along the lake, promenade and devour delicious food and wine. 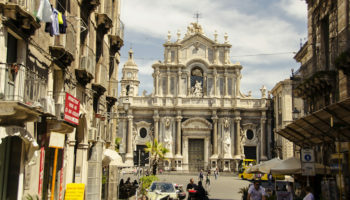 Lecco is a key transit hub for trains traveling to Bergamo and Milan – but make sure to stop off to try the Sicilian-style ice cream that Lecco is well known for. NH Lecco Pontevecchio – A world away from some of the more grand and timeworn accommodation choices dotted around Lake Como, NH Lecco Pontevecchio is a large, modern, resort. It’s surprisingly modern, actually, and comes packed with plenty of minimal, urban style. This applies to the rooms as well – think clean, sophisticated simplicity. The location of this place couldn’t get much better: the historic center of Lecco is a mere five-minute walk away, plus the train station is only a ten-minute stroll. Hotel Alberi – Set in the center of town, this family-run hotel is just 300 meters from Lecco train station, making it extra convenient if you’re planning to arrive (or leave) by train. The rooms at Hotel Alberi may not be luxury, but they are still newly decorated and comfortable. Moreover, the staff here are extra professional and very helpful, really taking care of guests and making sure they’re having an enjoyable stay. Not lakeside, but the shores of Lake Como are very close. 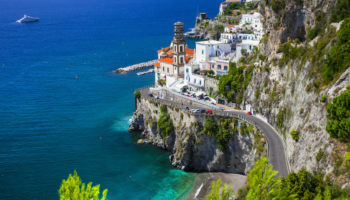 Beautiful Bellano’s big attraction is its beach flanked by luxury hotels with beachside swimming pools, and scattered with bars and restaurants that overlook Lake Como. 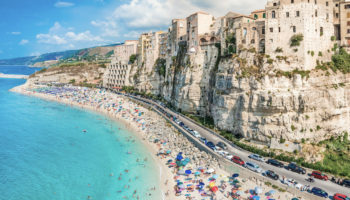 Enjoy your Italian break relaxing on the beach surrounded by the panoramic views, or soaking up the culture that the town is famous for. Bellano becomes busy with visitors in August when the town holds an opera festival, and there are many old churches and ancient local villages in the surrounding hills – this and the terrain makes the area great for hiking. Hotel Meridiana – This cozy, charming little hotel is nestled right on the water’s edge, complete with a sun-drenched garden and a beautiful terrace. Each room comes with its own balcony boasting utterly stunning panoramic views for designer sunsets. Summers at this lovely hotel mean dining practically on the lake itself, which is an amazing experience. This hotel has a bonus: it’s very own slice of (stony) beach, complete with sun loungers, where you can dip your feet into the water. Little Lezzo is made up of a number of small hamlets that span the area between the shore and the mountainside. Pretty traditional homes with their delicately designed gardens overflow with flowers and wildlife. Lezzeno is all about its sweeping views across the lake across beautiful Isola Comacina, an island in the lake. Discover the villages intriguing secrets and history and learn more about the traditional crafts the area is famous for. Enjoy a coffee and socialize with locals, and stay at stylish hotels nestled among bars and restaurants. This town isn’t on the tourist trail and is a great chance to spend some time in a more authentic – and less busy – area of the lake. Filario Hotel & Residences – This 4-star offering is a luxurious choice. It’s got it’s very own infinity pool overlooking Lake Como – it’s mesmerizing to swim and feel as though you could just carry on right into the lake. The rooms are finished with luxury furnishings and a high-end taste in design for a super comfortable and plush place to stay. The various suites offer different lake views, too. It’s the perfect place to take a break from the sometimes-busy towns along the lakeside and features its own private beach and restaurant. Hotel Villa Aurora – If you’re looking to stay in a vintage-style hotel boasting a cocktail of traditional Italian touches as well as modern luxuries, then Hotel Villa Aurora is the place for you. Boasting a private beach right on the shores of the lake, it’s easy to fall in love with the setting of this 3-star hotel. There are two bars to drink at, plus a restaurant with a terrace where you can dine against the backdrop of Comacina Island. 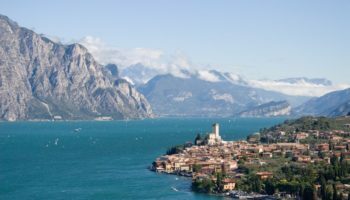 The popular resort town of Cernobbio sits close to the border of Switzerland at the foot of Monte Bisbino; here’s where you can find some of the most stunning old Italian villas on the lake. Choose to stay in one of the self-catering apartments in the town that overlook the lake – or splash out and stay in the iconic Villa d’Este, which has welcomed influential guests for many years. The town is also the start of the Via dei Monti Lariani hiking route to Sorico, plus a great location to travel to other sites on the lake since most bus and ferry services stop here. Hotel Asnigo – A large, sumptuous Art Nouveau building that’s less than a kilometer from the lake, Hotel Asnigo features modern rooms finished in a soft, neutral style and color palette. It boasts a large promenade with spectacular views of Cernobbio town and the lake – perfect for a stroll or to watch gorgeous sunsets. The building itself is over 100 years old and has been meticulously restored for a decidedly romantic place to stay. If you’re on a road trip, this is easy to get to from the Milan highway. Hotel Centrale – This hotel is set in a large, traditional villa for a slice of authentic Italian charm. As you might have guessed from the name, it has a great location – right in the center of Cernobbio; plus, it’s just 100 meters from Hotel Centrale to the shores of Lake Como. The rooms boast classical period features which have been stylishly updated for a plush place to stay. Thinking of getting out on a boat? The harbor is 200 meters away. With views across the lake and ancient architecture, Tremezzina is a busy town that’s made up of a few smaller settlements. The area’s classically Italian villas and palatial hotels slip seamlessly into the surrounding landscape of the lake. Slip easily into this town’s pace of life and admire the medieval remains of its fortress. Spend time at the Villa Carlotta with its large park and in-depth art gallery. There are budget hotel rooms available in the area, which can work as a perfect place to spend time exploring Lake Como. Grand Hotel Tremezzo – This 5-star hotel is superbly grand. Right on the edge of the water, this is the place to stay if you’re looking for incredible lakeside luxury. The pool here is actually, somehow, in the lake itself. There’s also an outdoor hot tub overlooking the lake, a gym, and even jogging paths that wind through its lovely, spacious grounds. It’s genuinely the ultimate in elegance. Inside, Grand Hotel Tremezzo is all about sophisticated opulence which we can’t help but love. Hotel La Perla – This hotel is nestled in the hills of Tremezzo with views overlooking the lake. It’s a scenic, serene place to stay. There’s a small outdoor pool to enjoy, surrounded by picturesque olive trees – plus, there’s a terrace bar where you can enjoy a drink with a view. You can soak up vistas of the lake from the balconies of the rooms, all of which are decorated in traditional Italian style. Set away from the town, you can walk down to it in around 15 minutes. Cadenabbia is surrounded by stunning scenery and is a popular spot during the spring and autumn as the landscape’s trees change color. The town is famous for being a spa resort where visitors return year after year to enjoy the health benefits of the area. Gorgeous villas with huge gardens, stylish hotels with pools, and riviera locations offer well priced rooms for such luxury environs. Grand Hotel Cadenabbia – This hotel truly is grand. It’s got amazing views of the surrounding lakes and mountains, with some lovely viewpoints, too. It boasts a beautiful outdoor pool, set in verdant gardens. Spend your days soaking up the sun on the rooftop terrace and simply enjoying the romance of the sophisticated Italian decor inside the hotel. It’s right next to the botanic gardens of Villa Charlotta if you feel like getting out to see some of the nearby sights. Hotel Riviera – Boasting an amazing location that incredibly looks across Lake Como all the way to Bellagio, this hotel has been in the same family for 30 years and dates back to the late 19th century. If you like the sound of staying in a part of the heritage that makes Lake Como what it is today, this place is for you. But it’s more than history; though the antique features are amazing, the family who run it make sure that it’s got a lot of heart and homely feeling. Oozing European sundrenched style, Moltrasio’s gorgeous 19th-century villas have played host to influential figures such as Winston Churchill and Gianni Versace. Enjoy exploring the picture-perfect architecture and luxe lifestyle of the rich and famous that stay in the villas, and spend your time decadently daydreaming as if you were in a Hollywood movie. Expensive and exclusive, hotel rooms in this part of the lake come at a high price, but then how much would you pay to be next door to the likes of George Clooney? Grand Hotel Imperiale Resort – If you’re looking for somewhere that has quite literally everything to make your stay comfortable by the lake, then Grand Hotel Imperiale Resort is the place in Lake Como for you. The hotel itself is an old Art Nouveau villa dating back to the 1920s and simply oozes atmosphere and high-end service. It’s endlessly sophisticated and ornate. You can spend your time enjoying treatments at the hotel’s very own spa and wellness center, enjoying a Turkish bath, playing tennis, or renting a boat to explore the lake. On the eastern part of the lake, Malgrate sits in front of Lecco and is connected by a bridge – namely, the Azzone Visconti bridge, which was built in 1336. Walk right along the edge of the lake and its beach as the sun sets behind the surrounding mountains. Excursions to the nearby scenic spots are easy to reach by the connecting road. Spend your weekend nights staying in tastefully furnished villas and being surrounded by nature. Clarion Collection Hotel Griso – Just 15 minutes to the center of nearby Lecco, Clarion Collection Hotel Griso is a decidedly upmarket place to stay. The rooms here are done to a high standard and come packed full of modern twists (circular beds, for example) and, of course, large windows so that the stunning surrounding scenery feels like it’s right there in the room. You can take a dip in the rooftop Jacuzzi with views of the mountains and lake, then enjoy a traditional Italian meal at the hotel restaurant. Hotel Promessi Sposi – Surrounded by mountain views, this 3-star hotel is a great place to stay if you’re interested in hiking – or cycling since you can actually rent bikes from them, too. The rustic style bedrooms here are very nice and the views are so amazing you can even see Lake Como from your pillow! There’s a great onsite restaurant where you can dine right next to the water. All in all, this is a quiet and relaxing spot to spend time soaking up this incredible part of the world. The last village in the eastern shore, Colico sits at the foot of Como’s highest peak, Monte Legnone. 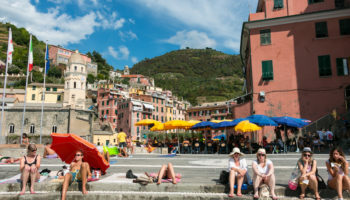 The town has great transport links with a ferry that connects to Como and Lecco along with train connects to Milan. The perfect location to dip your toes into the culture of Como, here you can check out some culture by visiting the ruins of an old fort; and this area of the lake is very well known for kitesurfing. Stay at one of the mid-range hotels which work as a great place to stay for family vacations. Hotel Lago di Como – Located inside a classic building in the center of the village and close to Colico’s train station, this hotel is a convenient place to stay if you plan on leaving or arriving by rail. The modern rooms are decorated with vintage touches like high, wood-beamed ceilings for beautifully comfortable interior design. From here, it’s easy to catch a boat to nearby towns. All in all, for the location alone, it’s a great base to explore what Lake Como has to offer. Stay off the beaten track in the little hamlet of Argegno and immerse yourself in local life and authentic culture. The perfect spot for a romantic break, here you can hide away in the unspoilt corner of the busy lakeside settlements. This is the kind of charming place that enchants visitors to stay much longer than first planned. Stay in traditionally colourful homestays and local inns. Villa Belvedere Como Lake Relais – With a perfect location in the middle of the village – as well as just a few minutes’ stroll from the pier – Villa Belvedere Como Lake Relais is a great place to stay. Rooms are spotlessly clean and boast large bathrooms. There’s a spacious waterside dining area where you can watch the boats come and go – or watch the sunset over the water – with a glass of wine or a delicious meal in front of you. This cozy hotel also comes with its own private beach. Artistic and beautiful, Gravedona is a traditional fishing town that now attracts holidaymakers with its style and delicious cuisine as well as opportunities to enjoy the outdoor sporting activities on the lake. The atmosphere is tranquil as visitors enjoy the laid-back lifestyle and landscape around the lake. Take time out and sit in one of the lakeside cafes and spend time wandering around the walls of the old town. Stay in locally owned bed and breakfasts in charming traditional houses. Tullio Hotel – This hotel is more of a modern offering than most other Lake Como hotels, but it still makes for a gorgeous place to stay. It’s a family-run hotel with a whole lot of heart. It’s contemporary and clean, and the location is actually very peaceful and tranquil. That said, it’s still within walking distance of the town and its ferry terminal. There’s a big outdoor pool to lounge around as well as a beautiful lawn that stretches all the way to the lake itself.